When you think of Norway, you think of fjords and snow-capped mountains that seem like they touch the sky. Waterfalls cascade from rocky peaks. Houses painted Scandinavian red perched on tiny islands look out over flowing waters. The Norwegian fjords and surrounding terrain are a perfect wilderness. So what is the best way to see the fjords in Norway? I started to become obsessed with seeing the fjords from as many different angles as I could on our recent trip to the fjords that began in Bergen and ended in Flåm. Fjords are long and narrow inlets flanked by steep sides or cliffs that were created by glaciers eroding mountains in their path. The inlets are often very deep – sometimes up to 1300 metres! Where the fjords meet the coastline, they are dotted with thousands of skerries or small island rocks. 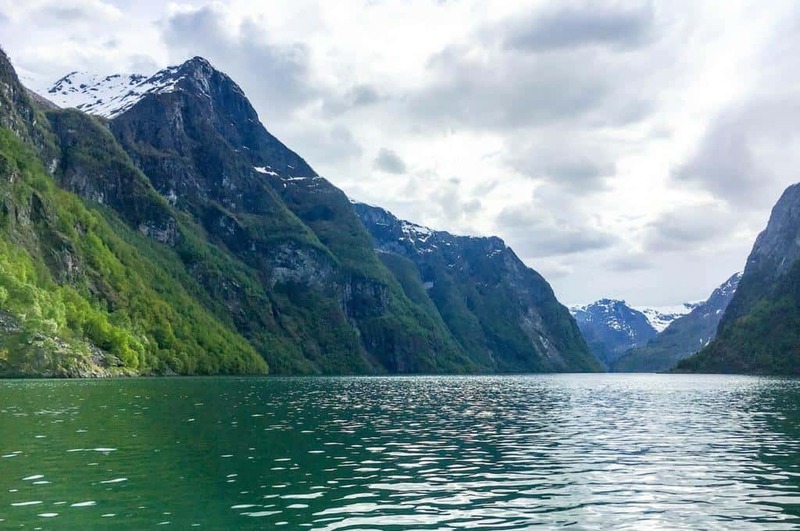 There are 1,190 fjords in Norway. We only managed to see a few of the major fjords – Sogneford, Aurlandsfjord, Nærøyfjord and Osterfjord – and they are some of the most beautiful natural landscapes I have ever seen. Try to get a window seat if you are flying into Bergen. The views from altitude on a clear day are incredible. You get a full perspective of the landscape and can see in detail the tiny islets and skerries unique to this part of the world. In Bergen take the Fløibanen funicular to the top of Mount Fløyen for impressive views of Bryggen and the area surrounding the city. You take the funicular from the station close to Bryggen. Tickets are 95 NOK for adults , and the attraction is open all year round – more information. For spectacular views of the Aurlandsfjord near Flåm, you must visit the Stegastein viewpoint. Jutting 650 metres above the fjord, from here you can admire the landscape back towards Flåm and in the other direction to Undredal. To get here, you can drive or take a bus tour from Flåm – more information. Many people take the popular Bergen railway train and bus route via Voss and Gundvangen to reach Flåm. We opted to take the ferry service on a high-speed catamaran down the Søgneford instead. I’m so glad we did. The largest and deepest of the fjords, Sogneford is also known the King of the Fjords. The journey is scenic and probably the best way to appreciate the changing landscapes along the fjord. The boat passes through wide open water and skerries. You can spend time on deck watching waterfalls cascade dramatically down cliff faces and try to count how many you see. There are several stops along the way when the boat slows down, so there are plenty of opportunities to take photos and enjoy the landscapes out on deck. Conditions on the ferry are comfortable with huge glass windows so even if it is cold you can enjoy the views. There are luggage storage areas and a cafe onboard as well as wifi for those who need to be connected. The ferry service departs daily from Bergen from 1st May to 30th September at 8:00 am and takes 5 hours to reach Flåm. Prices are from NOK 865  and children under 4 travel for free – more information. Bergen is rightly called the gateway to the fjords. You can take tours north and south to explore the many islands and inlets that are features of the landscape. We took a three-hour cruise from Bergen to Mostraumen on the Osterfjorden. Heading northeast from Bergen, the cruise takes you past tiny settlements perched strategically to capture the best vistas of the fjords. Mountains rise majestically above the fast flowing waters and waterfalls seem to appear around every corner. I was surprised at the diversity of the terrain and how narrow the channels between islands are at points along the route. You’ve never tasted water so pure as the crisp clear drops our guide collected for us to taste when we stopped close to a waterfall. The Osterfjorden fjord tour vessel is a comfortable modern catamaran and leaves from the Zachariasbryggen pier outside the fish market and the tourist office on Bryggen Harbour at 10:00 am and 14:00 pm daily with another sailing at 18:00 pm in July and August. My favourite experience of our short time on the fjords was joining a Fjord Safari in Flåm. Not surprising really as I love specialist guided tours. After being suited up in warm, waterproof clothing, hats and gloves, you hop into a small speed boat and go whizzing across the world heritage Aurlandsfjord. Your guide gives you lots of interesting tidbits of information about the local area and history and helps you spot local wildlife. Yes, seals and porpoises live in the fjord. Where Aurlandsfjord meets Nærøyfjord, there is a hairpin bend, and your speedboat glides across the waters as dramatic mountains loom overhead. Your guide will tell you stories and legends inspired by the landscape and of Vikings who once lived there. We chose to join the 3.5 hour Heritage Taste Safari which includes a stop in Undredal to taste the local award winning goats cheese. The cheese is delicious and the stories behind how it is made equally fascinating. The Fjord Safari seems quite adventurous, but it is an activity for the whole family to enjoy. Our preschooler twins had a blast. The company runs a range of tours that differ depending on the time of year and length of tour you wish to take – more information. One of the world’s greatest train journeys, the Flåmsbana railway connects Flåm and Myrdal a mountain station over 850 metres above sea level. Built between 1924 and 1940, the Flåm Line is a great engineering feat due to its steep gradient and over 20 tunnels along 20 kilometres of track. The journey takes just under an hour and you past gaping gorges, massive waterfalls and the small hamlets and farms that the railway was built to serve. You constantly crane your neck to see what natural wonder is around the next corner. It’s an incredibly beautiful journey worthy of all the accolades. A short stop at the Kjosfossen waterfall is your opportunity to experience the full force of nature. We visited in Spring, and the waterfall gushed over the rocks in spectacular fashion. There’s no better way to appreciate the terrain than when you walk and hike through it. The Norwegian fjords attract hikers from all over the world as there are many trails in the region suitable for people with all levels of fitness. Our experience was quite tame as we had small children with us but I’d like to go back to the region and try some of the more challenging walks. Here is a list of top 5 hikes in Norway to add to your list – the ones to note in this area are the hikes in the Aurlandsdalen Valley. You can also hike back to Flåm from Myrdal after taking the Flåm railway. The downhill route takes around 5-6 hours. We stayed at the Flåmsbrygga Hotel in Flåm, and they were only too happy to help with a list of shorter walks taking in waterfalls and fjord views. Tip – due to weather conditions, most of the walks are suitable for hiking between June and September. Having experienced the fjord safari tour and getting close to the water, if we visited again, I’d like to try a kayak tour. I watched people paddling out across the fjord from Flåm, and it looked like the perfect way to connect to the water and truly appreciate just how magnificent the Norwegian fjords area is. You can do half day tours and overnight kayak tours with Njord Sea Kayak who are committed to respecting the local environment and wildlife. If you want to relax and simply enjoy the scenery you can always join a small group tour and let your guide manage the logistics for you. Here are some suggestions based on our experience and feedback from travelers we met along the way. I haven’t mentioned the overnight cruise liner option here, and there’s a reason why. When you are visiting a country to experience its incredible natural wilderness, it is disturbing to be confronted by cities afloat. We saw three mega cruise liners dock while we were in Flåm. They offloaded thousands of people who flooded the tiny town and dispersed on their own fjord adventures – some of these mentioned above. There is no doubt that these ships make an enormous contribution to the local economy. And I’m sure the views on deck would be fantastic. But there’s nothing like having the wind in your hair and the fresh waters of the fjords splashing your face to feel truly at one with nature. And after all, isn’t that what you’re there for? Thanks to Visit Bergen and Fjord Norway for kindly supplying Bergen city cards and our tour to the Stegastein Lookout. This post contains affiliate links for products we recommend. All opinions are our own. Great advice and beautiful pictures. I once went fishing on a fjord near Bergen (think the Sonjefjord) in a small rowing boat. I caught a bright blue fish which nobody recognised. I put him back of course. Thanks Wilbur! Fishing on the fjord sounds wonderful. I’m sure little bluey enjoyed the rest of its life swimming in those pristine waters. So many options! 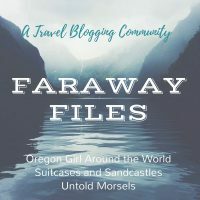 After my recent trip to Oslo I’m really eager to head back and explore the fjords, so thanks for this great round up. 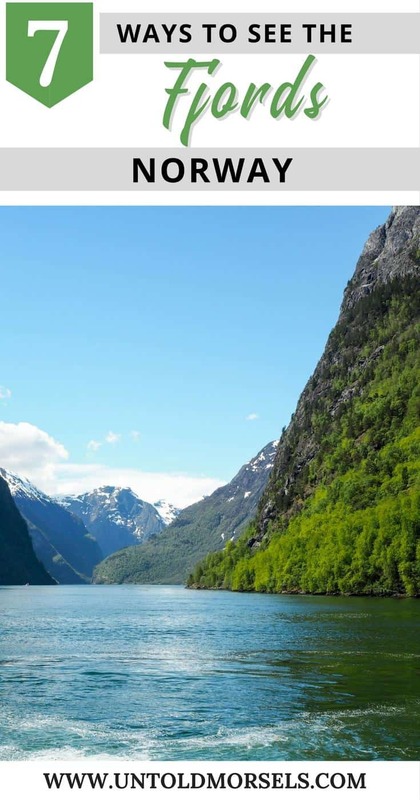 I love the fjord safari – sounds ace! Thanks for sharing your local perspective Van. Cruise ship travel is such a conundrum. I completely acknowledge the importance to local communities and I think the environmental impact was managed well in Norway, helped by the topography and deep fjords. The train journey sounds amazing! And Norway is climbing its way towards the top of my list of places to visit next! Such a beautiful and unique landscapes. We are thinking of doing a Norway trip next year or even late this year. Great post and I’ll have to come back to this. Wow Liana – what a place to grow up! Such a beautiful place in the world. I am amazed by the figures in here. Didn’t know there were so many fjords on Norway. Agree the scenery is spectacular. I have heard a lot of people seeing it is some of the best they have seen in the world. thanks April – the kids thought they looked very cool! FJORDS in Norway are so so beautiful. These pics are amazing. Our planet consists of lots of beautiful places; and the pictures of some of those places are here in this post 🙂 Epic!! Do you know, I’d never actually thought about what a fjord might actually be. Norways, fjords, I thought, and that was it. So now I know, and clearly I want to go. Definitely a river cruise is my choice for how to experience them. We’ll be heading this way later this summer, so this will come in very useful – thank you! In particular – of course – I am eager to get out on a fjord or two by kayak. Don’t get me started on cruises… Thank you for bringing this “irresponsible tourism” issue to your readers’ attention. How exciting Jonny. The kayaking looked amazing but the fjord safari was a nice compromise. Looking forward to reading your posts! Thanks Jo! It’s an incredibly beautiful spot and we picked a great time to visit with the kids. They really enjoyed themselves and we didn’t have much extra to pay as they are under 4! Nordic landscape is honestly the most beautiful I have ever seen! Your pictures are amazing and they are making me wonder why I haven’t visited Scandinavia yet! Great article. However, you refer to “Søgnefjord” as the “The King of the Fjords” which is not correct. In Norway, it is the Sognefjord which is the largest and deepest, so I reckon you just have a misspelling here? Thanks for the views and details Katy. I am planning to visit Norway in first week of July for about 8 days. Your blog has really helped me in finalizing my itinerary . Keep sharing?